Hope is an emotional belief in a positive outcome (believing you can be out of debt) within your personal life. Hope implies a certain amount of perseverance (which is persistent determination to adhere to a course of action) in which one is believing that a positive outcome is possible even when there is much evidence to the contrary. It is a brief period of extravagant spending or a brief indulgence of your impulses. Do you have occasional moments you over spend? 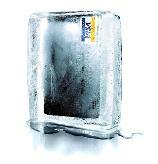 I froze my Credit Cards to get out of debt! It was the best decision I made in my life. I am feeling the freedom and I must say it feels good. Do you want a sense of self-worth, dignity, self-respect, and control over your finances and, ultimately, your life? We're spending tomorrow's money when we put things on a credit card. You keep locking yourself up and losing your freedom. Our bottom line on financial health? If the following statements describe you, you may be at risk of being a compulsive shopper. 1. 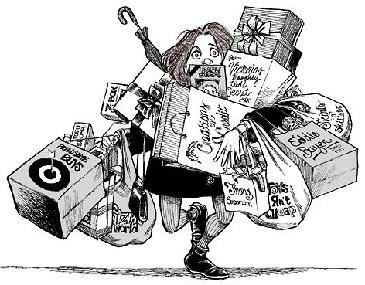 You get a"rush" from shopping. Buying gives you a "high" or a "pick me up" similar to downing a few alcoholic drinks. 2. You buy items you don't need. Your closets are full of unused possessions that still have the price tags attached. 3. You keep purchases secret. You lie about how much you've spent or what you've bought, and hide packages and receipts. 4. You buy with money earmarked for bills. 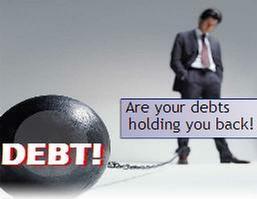 Your debts are mounting, you're maxing out credit cards, and collectors are calling. 5. You feel guilty and ashamed. Your shopping habits are causing problems in your relationships and interfering with work, but you still can't manage to stop. You wonder why - BILLS ARE STRESSING YOU OUT? The Leading Causes of Overspending - Are You Guilty of Them? It is very easy for a person to overspend their money. With ATMs around every corner and credit cards being sent to you in the mail everyday, it seems like money is always available to spend. Well, you may think you have money to spend, but do you really? Most people don't even realize they are overspending until they are made aware of it or their debt gets so out of hand that they don't know what to do. Easy access to credit such as credit cards, car loans, home equity loans and other lines of credit allows a person to spend money that they do not have and pay it back in monthly installments. But what people don't realize is the big picture. You may be spending $1000 ultimate after interest on that $700 television that you got at such a good price. Here are the leading causes of overspending. Read them over carefully and see if you are guilty of any of them. It may help you change your ways before you end up in debt up to your eyeballs. Credit cards make it so easy and tempting to spend money that you don't have. All you have to do is simply hand over your credit card and worry about the money later. 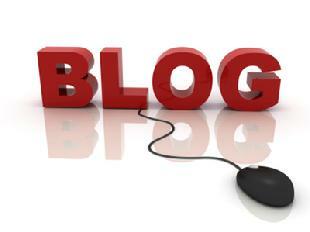 If you pay off your credit card bills in full every month, then credit cards may work for you. But, if you are carrying over monthly balances on your credit card and paying high interest rates, there is only one thing that you need to do: get rid of the credit cards. Cut them up! After you have cut them up, do all you can to pay them off in full and only pay cash in the future. If you only pay the monthly minimum payments on your credit cards, you are never going to be able to pay them off. Interest will continue to pile up on the bill. Also, if you continue to use the credit cards and only pay the minimum monthly payment you will have debt for the rest of your life. 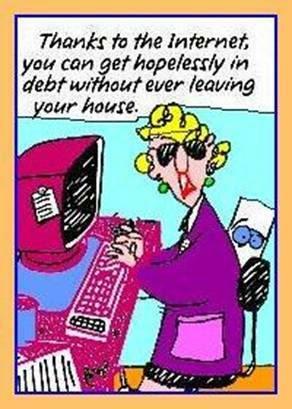 You will always have to worry about that debt hanging over your head. When's the last time you asked your friends to go out somewhere cheaper when you hung out with them? You probably never have. Going out to dinner, movies and clubs can really add up and make you overspend, but you don't want to miss out on the opportunities to be with your friends. Some of your friends may have more money than you and you are just going to have to face that. Maybe you skip dinner and just go out to the movie afterwards. After working hard during the week or having a tough week at home, most people feel like they deserve to indulge a little bit and that means shopping or eating at a fancy restaurant Shopping and expensive things may make you feel better for a couple of minutes but when the bill comes you are going to feel even worse. Especially when the credit card bill comes and you can't afford to pay it. Trying to Keep Up With "The Jones'"
It could be another family member, or a friend or even maybe someone at work who really don't like, but you always have to keep up with them. You have to have the latest technology gadget or the latest designer clothes just to "top" the other person. If you see someone with something that you want, you have no remorse and you just go buy it or something better just to keep up with other people. This will only get you farther and farther into debt and it will never stop. Stop and look around at all that you have now and be thankful. So many parents are guilty of overspending on their kids. The mom may wear clothes from Wal-Mart but she will whip out that credit card when her son wants the latest $150 sneakers. Parents have a hard time saying "no" to their children and that always leads to overspending. Spoiling your kids like that when you don't have the money will only teach your kids bad judgment and poor financial skills. They will grow up thinking that "money grows on trees" and that material goods are so important.